Don Smith (California, United States) on 29 May 2008 in Landscape & Rural. I've just returned from a scouting trip to northern Arizona with my friends, Mike Hall, Gary Hart and Jay Hart. I am planning a spring 2009 workshop which will cover not only the Grand Canyon, but also Horseshoe Bend, Antelope Canyon and Sedona (please check website for details). We decided to shoot sunset from Hopi Point on this particular evening and were treated to a spectacular lightshow. This is one of many images from that shoot. I had been shooting towards the west when Mike called out that the sky to the north was alive with color. The canyon was falling into shadow but was bathed with this awesome warm light, so I used a Singh Ray 5-stop split neutral density filter to balance the tones. This image needed very little work in Photoshop. I will probably be accused of saturating the color, but believe me, it was this warm! 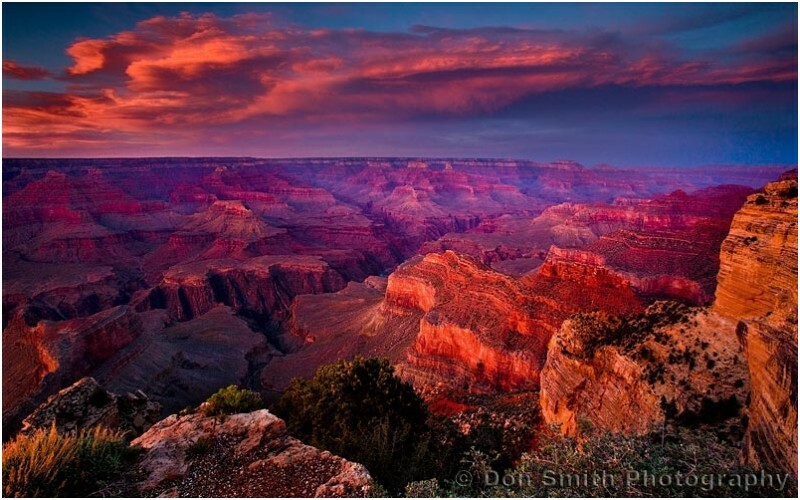 To see more of my landscape images, get details on this and other workshops, or to learn more about my book On the Edge, please visit my website at http://www.donsmithphotography.com. beautiful image! The colors and sharpness are amazing! The canyon colors are reddish to begin with, when you add this warm light and have a canopy of clouds above you to cast it into the shadows, you can't miss. tremendous colours and good work with the split filter as well - well done! I started with a 3-stop but the shadows were very deep, so the 5-stop did the trick. Had to tone down the foreground rock just a bit. Incredible colors .What a scenic view ! WONDERFUL !!! really nice vista with beautiful colors ... excellent ! UUaauuhh!!! Fantastic photo. i travel a long time ago to usa and i stay in Grand Canyon. really special. We take an helicopter to fly over the canyon and it´s an experiense. Wow, all is said ! An amazing great view ! Wow, this image has seemed to struck a chord. It was an awesome sunset, this is one of many from that evening. Thanks to all of you for your kind words. I will be posting more images from my recent trip to northern Arizona. Please check back. Thanks for the nice comments. I do believe the Singh Ray 5-stop split grad is what really helped complete this image. The color was in the canyon, it was just a matter of balancing the sky and the shadows. Thanks again for the nice words. The colors do make the image look a bit like a painting. The Canyon is a beautiful spot, especially when you get light like this! By the way, congrats you are featured on the spotlight frontpage! I don't think I'm about to accuse you of anything other than taking mind-blowing photographs. This is glorious. I did not know this image was featured on the spotlight frontpage! Thanks for letting me know. outstanding Don. I have never been to the Grand Canyon, but of all the images i have seen, i have to say that this one is possibly the most beautiful!! You've captured it in all it's glory!! This was my 12th time shooting the Canyon and I have never experienced light like this. One of my friends commented earlier that this sunset was either going to be spectacular or a bust. I'm glad the former was true! Precious images to your blog, so I like to capture your environment, Colors and diversity. And really marvellous portfolio! thank you for sharing!! !